Originally, we intended this dish to complement Salmon Cakes with Greens, but we ended up serving it as a main meal a few days later. For those unfamiliar with quinoa, it’s a grain, similar in texture to couscous and packed with protein. It’s very filling, hence the decision to serve it as our main dish. 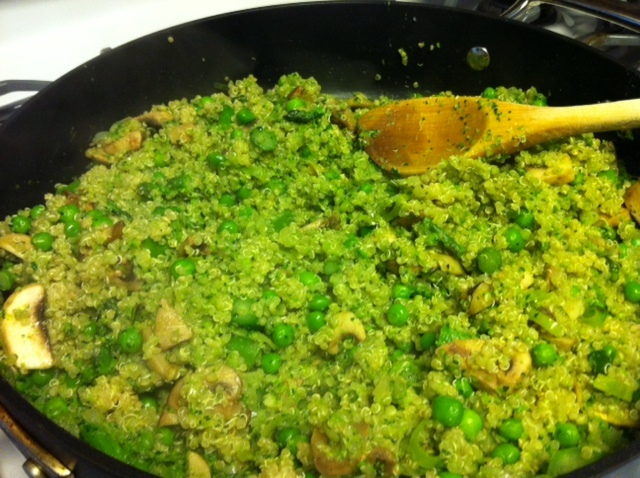 Though I was skeptical about it at first (I was put off by the bright green color, mushrooms and peas), this is a filling, savory and nutritious meal, perfect for weekday lunches or a pre-marathon energy boost.